A DRAMATIC T-SHIRT THAT STANDS OUT FROM THE REST! This stunning t-shirts includes cutting edge military graphics in mult-color printing on both sides of the shirt. On the back is a lage, draqmatic image of the Seabee combat badge and "We Build, We Fight!". 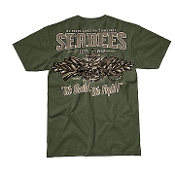 On the front left chest is a Fighting Bee and a bold SEABEE.